With a new investment, the Hakai Institute and our partners will be able to survey the coast in ways we could not from the ground. The Hakai Institute and our partners are advancing the way we survey from the sky. We call it the Airborne Coastal Observatory—a fixed-wing plane dedicated to mapping on the BC coast for the next five years in partnership with the University of Northern British Columbia, Vancouver Island University, and Kisik Aerial Survey. Hakai executive director Eric Peterson goes in depth about the Airborne Coastal Observatory in his latest short podcast. The aircraft will feature sophisticated technologies to examine and monitor indicators of climate change and inform a wide variety of scientific questions from icefields to oceans. 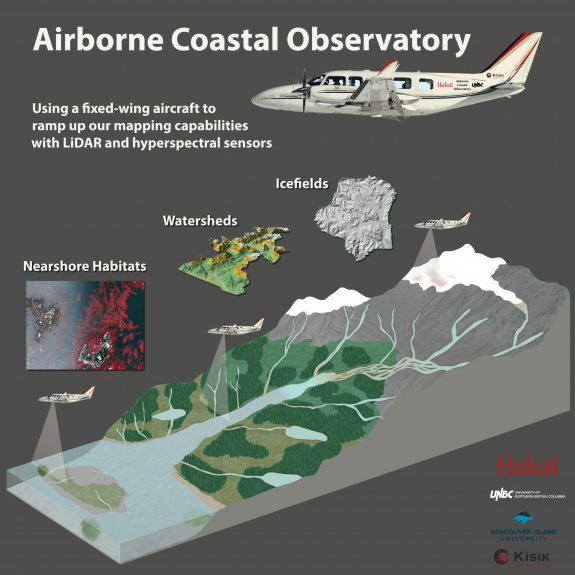 The Airborne Coastal Observatory will have some new instruments on-board. Hyperspectral imaging complements our other mapping technologies. This kind of imaging offers researchers an otherwise hidden view of coastal ecosystems, landforms, and processes.